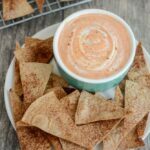 This Pumpkin Yogurt Dip is made with just a few simple ingredients and is the perfect afternoon snack! Try it paired with cinnamon and sugar tortilla chips or graham crackers. Taste and adjust spices and sweetener if needed. To make the Cinnamon and Sugar tortilla chips, cut whole wheat tortillas into triangles. Spray with oil or brush lightly with oil or melted butter. Sprinkle with cinnamon and sugar and bake at 350 for 12 min, flipping once. To make this even easier, start with vanilla yogurt and skip the vanilla extract and maple syrup.